There is something so simple about a pair of tights or leggings that makes them such an appealing choice of clothing for a toddler, or a baby. We've always opted for simple tights or leggings for our girls either alone, or under a skirt or shorts. Tights4Tots is a website dedicated entirely to luxury tights for little people; from babies through to toddlers and even children upto 5 years old. As you can see, Holly looks the business in her special Number 3 footless tights. Because she normally wears them under a skirt, she hadn't even realised that there was a special number on her bottom! When she did, she was very proud that she was sporting her age on her behind! These grey tights with bright pink stars are one of a large range of Blade and Rose knitted footless tights. Blade and Rose are a big favourite of mine - Lara owned a pair of pink cupcake tights when she was tiny and they lasted us so well and were certainly her most comfortable and well-loved item of clothing when she was two. The tights are a high-quality knit made from 75% cotton mixed with nylon and spandex to create a comfortable stretch. They are warm, and comfy and Holly feels right at home in them. Blade and Rose knitted tights all have a very cool design knitted into the bottom which makes them great fun to wear as leggings and, if your baby is sporting a cloth nappy, it makes a lovely squidgy baby bottom look even more squidgable! 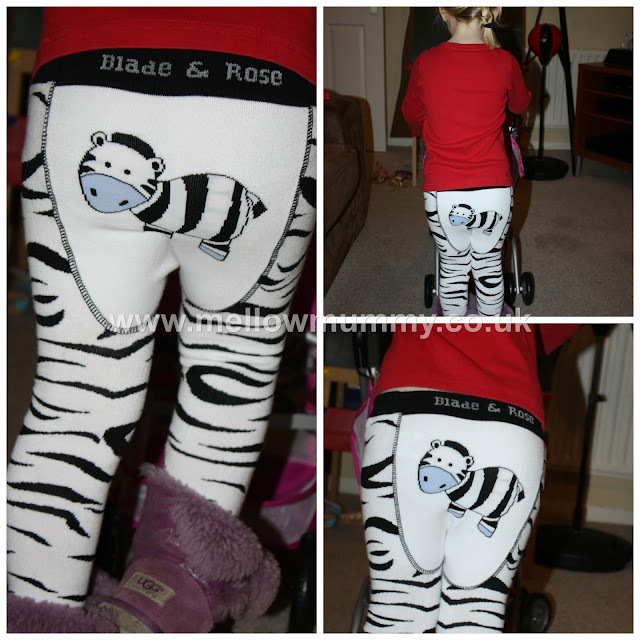 I absolutely could not resist these zebra-striped Blade and Rose leggings for Holly. The zebra bottom is a bonus but the tights look awesome whether she wears them alone, or under a skirt. These Blade and Rose tights and leggings are available in sizes from birth upto about 3 or 4 years. There are loads of designs to choose from suitable for baby girls or boys. From fire engines to daisies and pirates to apples - each with a colourful pattern along the legs that really make you stand out from the crowd. Tights4Tots also stock other brands of luxury baby tights and toddler tights - many of them are full-feet tights with non-slip soles designed specially for recently mobile toddlers. The designs are all bright and fun - you'll be spoiled for choice. Tights4Tots.com are offering free delivery on orders over £15 (thats around 2 or 3 pairs of tights). Look out for their VERY cool reindeer and christmas pudding tights too! You can find Tights4Tots on Facebook and twitter.